Stores4Stores is a Saas based application that personalizes the retail shopping experience for online customers. It leads customer to the store, or to interact with an associate via online contact. Stores4Stores web pages are generally described by as customer facing. But Stores4Stores also describes a process of data integration. On the one hand, there are the store pages that the customer sees. There also are the “stores for stores” in lower case. These are pages set up and used by a retailer’s technical staff along with Climb Technology’s service and support groups. Using the Stores4Stores application means that there’s an online store, a microsite, set up for the individual brick and mortar establishment. The microsite showcases SEO rich content, such as in-store specials, events, employee profiles, their blogs, interests, photos, videos, expertise, and much more. With that in mind how does a retailer go about setting up the two faces of Stores4Stores, the outward customer-facing side, and the inward administrative side? How are these various elements integrated into existing online solutions? Making certain that all elements of technology mesh in order to give customers the best experience, no matter the platform, is necessary in any retail environment. The integration process begins with an extensive and detailed technical questionnaire. Then it’s on to the three key integration points described below. 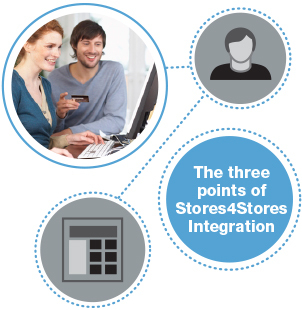 Home Site Integration – Most users of Stores4Stores already have web pages for their stores. These are generally one-dimensional pages accessed through a store locator feature via the main website. Integrating these URLs with the feature rich microsites that are a part of Stores4Stores is critical. It’s not just the path to send visitors from a store locator page to a local microsite. It’s also the channel through which shopper information leads back to the retailer’s ecommerce site. Even without the use of optional commissions tracking, properly set up URLs facilitate the “Featured Experts Overlay,” or the way in which individual retail associates are displayed within the microsite. Displaying current in-store inventory levels is also a feature that can be integrated within the Stores4Stores microsite. Data Integration – There are two ways that a retail Stores4Stores administer manage the associate profile data that populates the Stores4Stores In House Experts page. The first optional point of data integration for the customer to provide Climb Technology provides templates, or “feed samples” so that the relevant personal data can be populated nightly via CSV files within the individual microsite. The second optional point of data integration is to use the Stores4Stores Administrative site, which allows independent access by associates, managers, and administrators to update individual profile page and showcase the In House Experts. To see an example of how In Store Expert pages can be featured within a retail environment, check out that great blog and short video, which succinctly describes the power-of-the-personal through online channels. This type of user access is another way to tighten the integration between Stores4Stores and a retailer’s existing technology. Remember that the look and feel of the retailer’s current website will be emulated within the Stores4Stores microsite pages. The result is transparent to the shopper. When these points of data integration are complete, it’s fair to say that the foundation of Stores4Stores has been laid. Building the manager and associate profiles can begin. There are several different roles for managers, associates, and site administrators to fulfill within Stores4Stores. To continue reading about these roles, click here to view the defining user roles post. To view sample sites for Stores4Stores, visit the Climb Technology web page, or give us a call. We’ll be happy to show you how the data integration feeds the front-end microsites!